EITS provides multiple services to accommodate central authentication for UGA and its partners to authenticate using MyID credentials and, optionally, ArchPass two factor authentication powered by Duo. Each service is comprised of an authentication server and an application client which redirects calls for authentication to the authentication server. The client is installed and supported by the application administrators. EITS Identity management can offer only limited assistance for the client as each application may differ in the client implementation. Please bookmark this page for service troubleshooting, also see our FAQ. The Central Authentication Service (CAS) is a single sign-on protocol for the web which permits a user to access multiple applications while providing their credentials only once. It also allows web applications to authenticate users without gaining access to a user's security credentials, such as a password. The CAS service is UGA's primary authentication interface. The ST (Service Ticket), transmitted as a GET parameter in URLs, stands for the access granted by the CAS server to the CASified application for a specific user. The CAS server is a Java servlet whose primary responsibility is to authenticate users and grant access to CAS-enabled services, commonly called CAS clients, by issuing and validating tickets. An Single Sign On (SSO) session is created when the server issues a ticket to the user upon successful login. A service ticket (ST) is issued to a service at the user's request via browser. The ST is subsequently validated at the CAS server via back-channel communication. A CAS client is a software package that can be integrated with various software platforms and applications in order to communicate with the CAS server via some authentication protocol (e.g. CAS, SAML, OAuth). When the Application server's CAS client initiates authentication, it begins by redirecting the web browser to the CAS server's /login service with one or more parameters: https://cas.example.org/cas/login? There are parameters within this URL that can be specified–required or optional. Some of the more common ones are as follows: The /login service generates a service ticket. gateway [OPTIONAL] - if this parameter is set to true then the user will not be asked to re-enter their credentials. An important observation is that the 'gateway' and 'renew' parameters are not to be used together. In the event they are, behavior is undefined. service - though technically optional, this is the identifier of the application the browser is trying to access. In almost all cases, this will be the URL of the application. As a HTTP request parameter, this URL value MUST be URL-encoded as described in section 2.2 of RFC 3986. If a service is not specified, a service ticket cannot be issued and application sign on will not be able to occur. renew [OPTIONAL] - if this parameter is set to true, single sign-on will be bypassed. In this case, CAS will require the client to present credentials regardless of the existence of a single sign-on session with CAS and the user will have to log in each time. method [OPTIONAL, CAS 3.0] - The method to be used when sending responses. While native HTTP redirects (GET) may be utilized as the default method, applications that require a POST response can use this parameter to indicate the method type. service [REQUIRED] - identifies the service for which the ticket was issued. As an HTTP parameter, this value must be URL encoded. renew [OPTIONAL] - if this parameter is set, ticket validation will only succeed if the service ticket was issued from the presentation of the user’s primary credentials. It will fail if the ticket was issued from a single sign-on session. In the even that renew=true, if the service ticket was not generated by 'www.example.org', validation will fail. If you require more information, please elaborate on the access form. NOTE: The CAS service provides support for the SAML 2.0 protocol with backwards compatibility for SAML 1.1. New applications will default to CAS 2.0. Target [REQUIRED] - URL encoded service identifier of the back-end service. Note that as an HTTP request parameter, this URL value MUST be URL-encoded. The service identifier specified here MUST match the service parameter provided to /login. The TARGET service SHALL use HTTPS. SAML attributes MUST NOT be released to a non-SSL site. samlp:AssertionArtifact [REQUIRED] - the valid CAS Service Ticket obtained as a response parameter at login. Registration of Service IDs for CAS authorization can be requested with the following form: CAS/SAML (Gluu) Access Request Form . Newly registered applications will be subject to review and vulnerability scanning by the EITS Information Security department. Security Assertion Markup Language (SAML, pronounced sam-el) is an open standard for exchanging authentication and authorization data between parties, in particular, between an identity provider and a service provider. As its name implies, SAML is an XML-based markup language for security assertions. Web Browser – represents the user within the SSO process. The SAML protocol relies on HTTP headers and HTTP redirects. Identity Provider (IdP) – Sometimes called an Identity Service Provider or Identity Assertion Provider, it is an online service or website that authenticates users on the Internet by means of security tokens. Service Providers depend on an Identity Provider or Security Token Service to do the user authentication. Service Provider (SP) – This is a system entity that receives and accepts an authentication assertion issued by a SAML identity provider. A SAML metadata document describes a SAML deployment such as a SAML identity provider or a SAML service provider. Deployments share metadata to establish a baseline of trust and interoperability. When registering Service IDs for CAS/SAML authorization, providing accurate and compatible metadata from the service provider will be required. 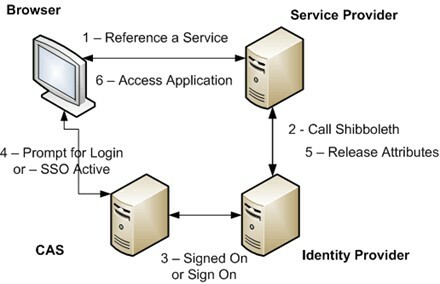 Then following diagram describes the flow of authentication between a User agent (web browser), Service Provider (SP) and Identity Provider (IdP). This is how each entity interacts in a SSO session using SAML 2.0 ONLY. If the user has already authenticated to CAS and has a valid CAS SSO session, the IdP will transparently perform the requested action, e.g. attribute release. If the user does not have a valid CAS SSO session, the user will be redirected to CAS and must authenticate before the IDP proceeds with the requested action. The authentication flow is similar to that of the SAML 2.0 protocol with some notable differences. Note that this process is primarily dependent on HTTP redirects through the user's browser and that the authentication is delegated to the CAS server. Rather than a user being authenticated by the IdP and then being redirected to the application, the user will be redirected to CAS and will need to be authenticated by CAS and then the IdP to gain access to the application. Unless otherwise requested in the CAS request form, Service IDs will default to use multi-factor authentication using UGA's ArchPass powered by Duo. After entering your MyID and password as usual, you will be asked to verify your identity with a device enrolled in ArchPass. You can find more information about ArchPass at Information Security's webpage. Multi-factor authentication should be required when your site contains sensitive or restricted information. For more information about data classification, see Information Security's webpage. Disclaimer: The content on this page is intended to be used for informational purposes only. For more information on CAS, visit their protocol specification found here. For more information on SAML, visit theirs found here. EITS does not own the CAS or SAML protocol.